Together with the architectural redesign of a space, the choice of feature surface can have a defining impact on a renovation. This serene bathroom is in a seaside home located just metres from the beach. The existing bathroom had a shower over a cast iron tub and needed renovation, says owner and architect Wayne Houston. To achieve these goals, Houston pushed out the footprint of the existing room and introduced floor-to-ceiling louvres on one wall in the newly gained triangular space. These offer privacy or private views as required and capture the late afternoon sun. 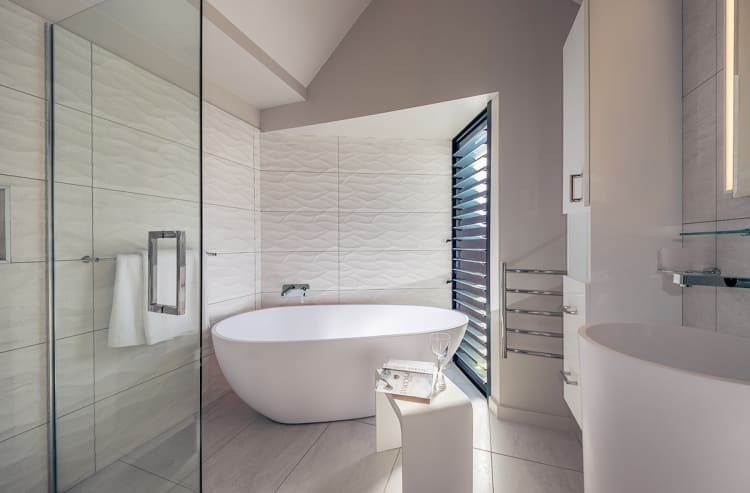 “When choosing tiles for the bathroom, we wanted something that linked to the beach house ambience and these wave tiles were the perfect fit,” says Houston. As well as connecting with the setting, the bathroom achieves a sculptural appeal, in part through the architect’s choice of freestanding tub and freestanding basin. The wall-hung vanity cabinet provides storage without taking up floor space. At the same time, the extension allowed room to accommodate the tub – making space for the walk-in showerstall behind. Recessed LED strip lights provide the general lighting for the transformed space.